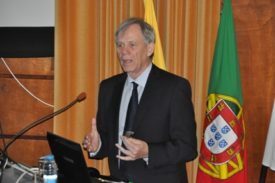 The 2014 Pulido Valente Education Award ceremony was held at the Faculty of Medicine, University of Lisbon on May 8. 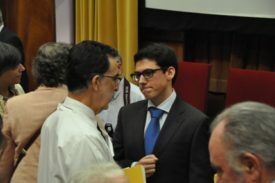 This award was granted to Afonso José Costa Felix de Oliveira, the undergraduate student with the best mark in Course Unit Module V.II – Internal Medicine, in the Integrated Master’s Degree in Medicine, with a course average mark of 19 out of 20. 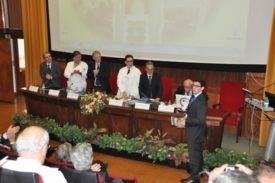 Professor Victorino, the FMUL Scientific Board President, opened the award ceremony and Professor Pulido Valente, the Pulido Valente Foundation President, welcomed the guest speaker, Professor Sakellarides. 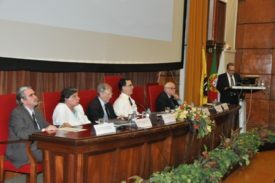 * In his address on “Knowledge and Health Policies in Portugal”, Professor Sakellarides, a staunch supporter of the National Health System, presented an in-depth view of health economics and funding issues. 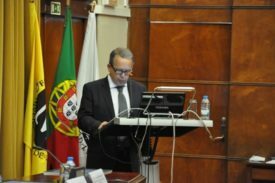 *Contantino Sakellarides is currently President of the Portuguese Association for the Promotion of Public Health, and elected President of the European Public Health Association. 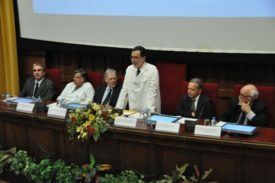 He graduated in Medicine from FMUL in 1967; in 1972 he obtained his Master’s Degree in Epidemiology from the University of Texas School of Public Health (UTSPH) where in 1975 he also completed his PhD in Public Health; he became a professor with full tenure in the Health Policies area in 2003 and is currently a Full Professor of Health Policies and Management at the New University of Lisbon National School of Public Health.